Pond to construction site, we have the pumps to clear out unwanted water. Looking for powerful pumps that can handle water and solids? 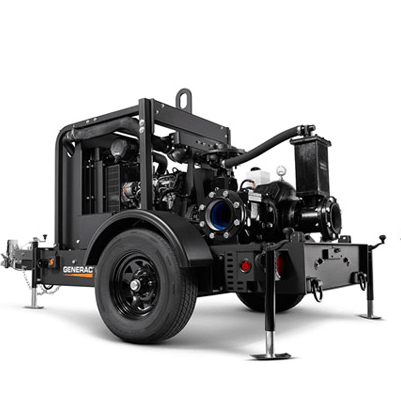 With the lowest intake height on the market, Generac l Magnum mobile trash pumps easily handle solids up to 3 in. (76.2 mm) in diameter, and operate for extended run times to ensure that your site is clean and ready for the next phase. Available in wet prime and high performance Venturi and Diaphragm dry prime models, these pumps feature a durable chassis and an optional sound attenuated enclosure (dry prime only) for quiet operation and maximum versatility that can easily go from road construction to neighborhood project.